Learn how to run Mechanic tasks in response to PayPal activity. Out of the box, this task only creates orders for PayPal events that reflect successful payments. But, IPN notifications cover all kinds of things: PayPal changes to subscriptions, changes recurring payment profiles, disputes, and more. If you'd like to do something more with IPN notifications, file a task request. There are a variety of IPN transaction types, and this task only covers a few of them. PayPal has documented the complete list, and it includes payments, auctions, mass pay, recurring payments, subscriptions, disputes, pay messages, adaptive accounts, and more. 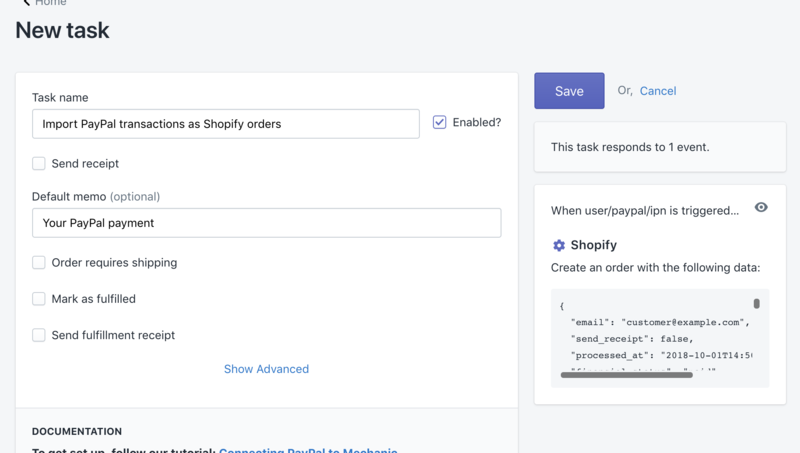 The order import task is a good illustration of how to use incoming IPN data to form a Shopify request. You adapt that task's code for any purpose, continuing to use IPN event data.